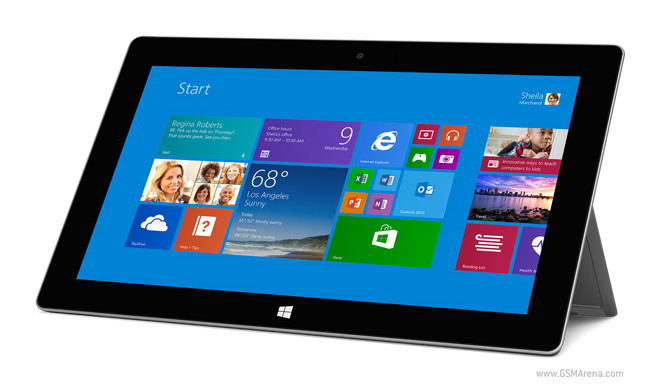 Microsoft has just announced its second generation Surface tablets – the Surface 2 and Surface 2 Pro. Both slates are thinner, faster and lighter, with better displays, USB 3.0-enabled, and powered by the latest 8.1 version of Windows 8 RT and Windows 8 Pro. As expected Microsoft is also launching a new lineup of Surface accessories including a new Type Cover with backlit keys. The new Surface 2 slate is powered by NVIDIA’s latest Tegra 4 chipset with a quad-core 1.7GHz Cortex-A15 processor, GeForce 72-core GPU and 2GB of RAM. The display also got a major upgrade: it’s now a 10.6″ ClearType 1080p display with 5-point multi-touch support. According to Microsoft the Surface 2 is up to 4x faster than the original Surface slate, offers 25% more battery life (10 hours of video playback, 7-15 days on stand-by), and features a 5x better camera and 2x faster bus and Wi-Fi speeds. The rest of the Surface 2 specs include Wi-Fi a/b/g/n support, Bluetooth 4.0, an USB 3.0 port, microSD card support, HDMI port and a 3.5mm audio jack. There are also a 3.5MP front-facing camera (1/3″ sensor size) plus a 5MP rear camera, both capable of 1080p video recording (stereo audio). The Surface 2 features an even better 2-stage kickstand. The Surface 2 is made entirely of Magnesium and should endure a few drops on the ground. Microsoft is giving you 1-year of free international calls and Wi-Fi through Skype, 200GB SkyDrive storage for two years with instant sync of your files, and, of course, Microsoft Office 2013 RT edition (Word, Excel, PowerPoint, OneNote and Outlook). 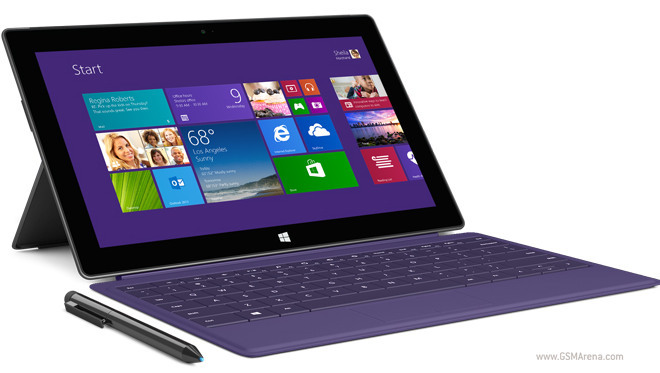 The new Surface 2 is thinner and lighter and will be available in 32GB and 64GB version. The suggested retail prices are $449 for the 32GB model and $549 for the 64GB one and it will hit shelves worldwide on October 22. The Surface Pro also got a proper upgrade. It uses the same 10.6-inch 1080p display the Surface 2 utilizes, but runs on fourth-generation Intel Core i5 chipset with a dual-core 1.6GHz processor (max turbo clock 2.6GHz) with multi-threading, Intel HD Graphics 4400, and 4GB or 8GB LPDDR3 RAM. There is also support for pen-input and the Surface Pen is included within the Surface 2 retail package. As advertized by Microsoft the Pro 2 slate has 50% faster graphics, 20% better performance, 75% more battery life and 50% more color accuracy on the display compared to the previous generation Surface Pro. The rest of the Surface 2 Pro specs include one USB 3.0 port, a microSD card slot, mini DisplayPort, Wi-Fi a/b/g/n, Bluetooth 4.0 and a 3.5mm audio jack. There are also two 720p cams – one at the back and one at the front, and stereo speakers. Finally, the new 2-stage kickstand is also here. Microsoft will be selling the Surface 2 Pro in 64GB, 128 GB, 256GB, and 512GB versions. All Surface 2 Pro models run on the latest Windows 8.1 Pro version, with 1 year of free international calls and Wi-Fi via Skype, 200GB SkyDrive storage for two years and one-month free trial of Microsoft Office 365 package. Surface 2 Pro will go on sale on October 22. The 64 GB model costs $899, 128GB price is $999, the 256GB edition is $1299 and the 512GB Surface 2 Pro is priced at $1799. We guess these prices are for the 4GB Surface 2 Pro slates, and you’ll have to add a good $100 more if you want 8GB of RAM. Quite expectedly Microsoft has announced new lineup of accessories to accompany the new Surfaces. The new Touch Cover 2 and Type Cover 2 are thinner, more rigid and with backlit keys. It Touch Cover 2 now has 1092 sensors compared to just 82 in the first Touch Cover and a proximity sensor for automatic backlighting is available on both. The new Touch and Type Covers 2 will be available in cyan, purple, magenta, and black. There is also the new Power Cover that is just like the Type Cover 2, but comes with extra battery behind the keys. It will supposedly give you 2.5 times more power on your Surface 2 slate. It will cost $199.99 and will launch in early 2014. Microsoft is also offering car chargers, wireless adapters for the covers, and even a new Arc Touch Mouse that now connects through Bluetooth and without a receiver that usually occupies an USB slot. Finally, there is the Surface Remix project, an attachable cover that targets musicians. You can learn more about it right here. All slates will be available on pre-order tomorrow across 21 markets and will launch on October 22. The availability of accessories either varies on different markets and models, or is yet to be announced (Surface Remix, Power Cover).